On Monday, Reuters cited analysts who said, “A spate of suicide attacks by Islamist militants could spark a war of revenge among ethnic Pashtun tribesmen in Pakistan’s northwest just as moderate, secular political parties appear poised for power.” On Sunday, a suicide bomber blew himself up among thousands of tribal members discussing resistance to the Pakistani Taliban [the meeting was referenced by Pakistani media outlets as a jirga, a tribal assembly of elders which makes decisions by consensus]. According to news sources, 40 people were killed in the third suicide attack in three days. The Washington Post cited Javed Iqbal Cheema, the Interior Ministry spokesman, who said the blast occurred while “five tribes were finalizing a resolution that would punish anyone who shelters or helps Al Qaeda, Taliban and other fighters…” The bombing occurred in the semi-tribal region of Darra Adam Khel, a town about 25 miles south of Peshawar, when most of the people had dispersed and “noted elders of the five tribes – Tor Chappar, Sherakai, Busti Khel, Zarghon Khel and Akhorwal – were discussing forming committees to implement the jirga’s decisions,” reported Pakistan’s Daily Times. A senior local official told the AFP, “The suicide bomber was an 18-year-old boy. His face is recognizable and initial investigations indicate he was a resident of Darra Adam Khel.”The recent spate of violence is both significant and worrying. The Pakistani security forces have been fighting Islamist militants in the northern areas since November, and although the military claims it has cleaned out most of Swat, attacks still persist in the area. 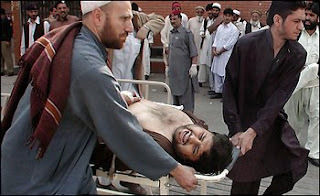 According to Reuters, analysts have noted a “dangerous trend” towards attacks that strike at the heart of Pashtun society. A former security chief for the tribal areas told the news agency, “These are direct attacks on Pashtun society…All institutions, which represent Pashtun society, the mosque, a wedding, a funeral or a jirga, they have all been targeted. They want to bomb the entire Pashtun society into submission.” Due to the strict code of honor these tribes live by, known as Pashtunwali, the recent attacks on a funeral [see Feb. 29 post] and on the jirga could trigger inter-tribal feuds, which could create a more explosive situation for the government. In my opinion, the recent string of attacks could further isolate support for the Pakistan Taliban, if the government responds accordingly – that means issuing statements condemning the attacks (already done), as well as seeing this as an opportunity to rally support from the tribal community by further vilifying the actions of the Pakistani Taliban. Ultimately, the tribal identity and code of honor should be emphasized in order to overshadow support for these militants.